This article looks at designing and printing a simple item sheet (proof sheet) with a plain background. A more complex proof sheet complete with background elements is described in the article Multi pose proof sheets"
Throughout this article we will be referring to the item sheet reproduced below. The template used for this item sheet is available for download here. A blank canvas appears. Click on the canvas to activate then enter the size of the template. The example above used a size 2.00" x 3.20"
The screen grab below illustrates how the template used above will look like in the Template Designer. Item Sheets in NeoPack/Professional and PackBuilder are created in Form Item Sheets Mode. After starting a new item sheet the "Subjects to Include" window appears. The "Templates/arrangement" window allows the user to select the item to be used for the sheet and arrange the item on the finished page. The settings below were used to produce the sample item sheet reproduced above. The "Item" section lists all the fixed size items present in the users template's directory. In this example only a single item is listed - simple proof. "Plain background" is checked which activates the parameters for arranging the item on the finished page. The "Sheet Page Settings" allow the user to set further parameters with regard to the finished item sheet. The settings below were used to create the sample item sheet above. Three levels of sort are available according to any subject or folder field. Check "ignore" to avoid including unmatched subjects (i.e. subjects without images) on the page. 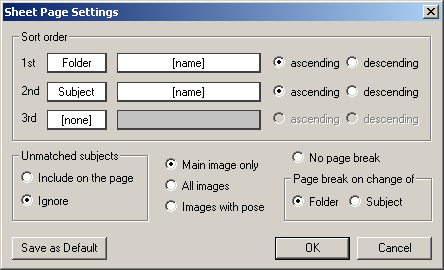 For multi-pose shoots the user has the option to include only the main image, all images, or just images for which a pose label has been explicitly assigned. Page breaks can be forced at the change of folder or a change of subject. If forcing a page break on a change of folder the primary sort order must be set to "Folder". When satisfied with the appearance of the item sheet proceed to print it by clicking the "Print" icon on the toolbar or File>Print from the main menu. In the screen grab below note the ability to select which sheets to print. Since images on an item sheet are usually small, it is recommended the "Use internal (thumbnails) images" option is checked. This option will use the thumbnails as imported into Images Mode instead of the full size original images and will therefore greatly improve printing performance and speed. The procedure for printing item sheets in DataPost is essentially the same as outlined above with the exception of the following key differences. DataPost does not have a Form Item Sheets Mode. Instead the item sheet is created and printed via File>Print from any of the other modes except the Template Designer (Design Mode). Once File>Print is selected the steps are identical to those described above. 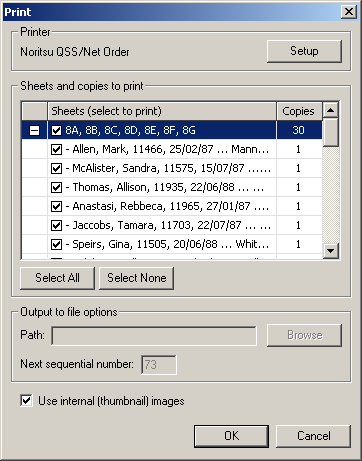 Item sheets in DataPost are most often used to print shoot cards and order envelopes for use with CapturPost.